SWCED-2112 is a ruggedized 10 Gigabit Ethernet switch that provides 8x GbE ports, 2x 2.5GE SFP ports and 2x 10 Gigabit ports with IP v4/v6 Layer 3 switching and MEF CE 2.0 Carrier Ethernet capabilities. 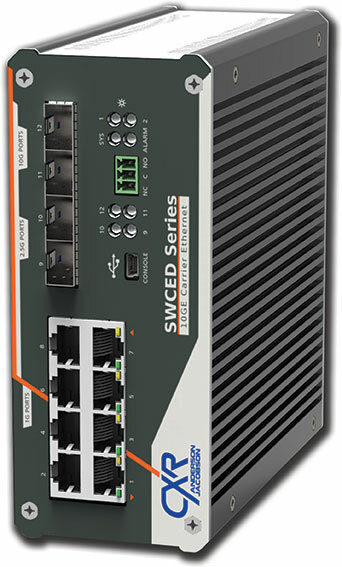 SWCED-2112 is a ruggedized 10 Gigabit Ethernet switch in a DIN rail format that provides 2x 10GE SFP+ slots, 2x multi-rate 2.5GE / GE / 100FX SFP slots, and 8x Gigabit Ethernet RJ45 ports. SWCED-2112 delivers a high level of security and availability to mission critical networks that require high immunity against extreme temperatures and electromagnetic disturbances. 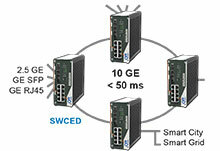 SWCED-2112 enables higher bandwidth upscales at lower cost with 2.5 and 10 Gigabit options. It provides MEF CE2.0 Carrier Ethernet services with strong SLA / QoS and G.8032 Ring Protection but also many security features such as 802.1X authentication and ACL rules.